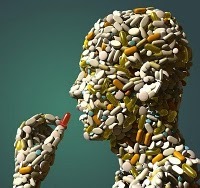 Mad World: Anti-Depressants Won’t Save Us, But Social Transformation Can! This Article first appeared in the Activist Post. One need only watch the endless procession of pharmaceutical commercials on TV or meander through the Internet to get the sense that North Americans and western cultures generally, are heavily reliant on so-called mood disorder medications. From depression to social anxiety disorder, Prozac to Paxil, it seems that the “modern world” is inhabited by humans gone marginally mad. Many mainstream articles and news sources uncritically report that stress, anxiety and depression are symptoms of modern society, while never raising the need to address the social ills that create human illness. While I agree with the claim that mood disorders may be symptomatic of modern society, I wonder if we have not wrongly focused on ‘pathologizing’ the individual rather than the society. If depression, anxiety and stress are indeed emblematic of the rat race known as the modern world/modern society, is it not more appropriate and productive to pathologize and treat the society rather than merely the individuals who are reacting to it? This calls for a total social transformation that will move us away from meaningless hyper-materialism and corporate mediated living, toward systemic harmony and clarity. To grasp the veracity of this suggestion, we must understand the need for harmony and balance with our environment–both natural and social. Proponents of hyper industrialization and Progress for progress’ sake, as well as die-hard capitalists often site Darwinian notions of “survival of the fittest” as a justification for the never-ending depletion of resources and destruction of our natural environment and the incessant dismantling of community interconnectedness. Humans, the argument goes, are the strongest of the species, and we have survived and must continue to survive by “conquering” (aka: destroying) and exploiting the natural environment. In other words, to survive, we must be lords of the earth rather than in harmony with it. However, organisms and species most likely to evolve and endure, are those most able to adapt to their environment and grow to thrive within it (without destroying it). Now, I would like to put forth an interpretation of adaptation that seems quite obvious and yet has not been the mainstream reasoning. Because our very existence depends on life sustaining forces (oxygen from plants and light from the sun for example) and the forces of protection (the atmosphere and its ozone for example) provided by the natural environment, destroying these forces can only be said to be antithetical to adaptation. Neo-cons and corporate pundits read adaptation as destruction and plundering, but what it really means to adapt to the environment, and thus thrive, is to live in harmony with it. Thus our relationship to the world and nature must be synergistic and not hierarchical. This is not a moral choice but a reality insofar as we are part of this meta-organism we call life, earth, the universe etc. What’s more, our interconnectedness with the natural environment is not a wacky, new age, feel good delusion but pure scientific fact. Undeniably, our physical existence is made possible through a feedback loop, in which we trade carbon dioxide for oxygen with plants and trees. When humans exhale we sustain the life of plants, and in turn human life is sustained when plants exhale. This literally means that we breathe in concert with and through the natural environment. Since we literally need the environment to live, adaptation necessarily implies a synergistic balance with nature not its unbridled destruction. This is not to say that we cannot live off of it, for surely we must, but not to the extent that we kill it. Ultimately, any species that destroys the very environment it needs to survive can never be said to be adapting to it, and cannot be seen as the “fittest.” Yet true to their disingenuous nature, the global corporate and financial elite would have us believe that they are destroying the world in order to advance it. However, after centuries of so-called Progress it is painfully apparent that unbridled industrial, economic and corporate “growth” is adversarial to healthy human development. In other words, the modern industrialized Western world is fundamentally at odds with real human (adaptive) needs and happiness. What is making us ‘crazy’ is that at our core, we are all deeply rational  beings with an innate sense of logic (and therefore justice), who reside in an irrational world. This relationship induces a mental “fissioning” and profound confusion within, thus facilitating a disconnect with and within the social order; resulting in social pathologies symptomatic of social anxiety etc. This form of mass cognitive dissonance makes the society crazy, while it ironically labels (and medicates) individuals as maladjusted to an insane world. But where is the proof? Let us return to those incessant, and freakishly surreal, television advertisements for anti-depressants. If humans in the “Western” world are truly well adapted to the environment, why is there so much dis-ease? Were the trajectory of the modern age indeed the correct one for healthy physical, social and mental development (and for existence generally) there would not be such a preponderance of physical and mental illness. Despite (or perhaps because of) all our money, technology, and hyper-materialism we are miserable. We are a species at odds with itself in a world gone mad, and we can all feel it. And duped into believing—through social pressures that create social pathologies—that this is the natural order of things, and that we cannot as socially disenfranchised ‘citizens’ change our external environment, we turn to medications to cope. We have become increasingly dependent on stimulants to make it through the day and sedatives to make it through our nights. But what we need to realize is that we are not sick, society is (and in turn it has diagnosed individuals as sick). Thus to “feel better” we need to fix society and all its ills. This has to start and end with all of us! The state and its corporate allies/masters will never do it for us because there are billions of dollars to be made in medicating citizens and keeping them docile and pliable; and also because a “bewildered herd” is easy to lord over. Social transformation, changing this mad world and creating something better is the only answer. Basically friends, we are living out of balance, and it is time to change the systemic channel so to speak. Don’t believe me? The proof is in the prescriptions! I use rational here not exclusively in the way in which it is employed by (Aristotelian) positivists as having to do with reasoning and man, but in its purely functional mode; as a biological by-product of the laws of nature/natural philosophy, where all living things conform to (and require) phenomenological consistently in the natural world. We are all part of the natural world, which is fundamentally consistent and currently at odds with our inconsistent man-made world.